Atlas is one of the most famous figures from Greek mythology and the image of his holding up a globe is still a powerful one today. 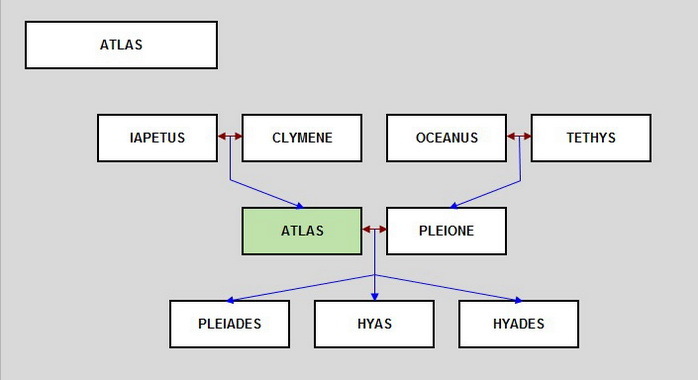 Many people will not realise though that Atlas was a god of the Greek pantheon, and the one time antagonist of Zeus. Many tales are told about Atlas in Greek mythology, and many of these stories are contradictory in nature. Atlas was a Greek god, but he was not amongst the famous Olympian deities of Greek mythology, indeed Atlas was of a preceding generation, being a second-generation Titan. 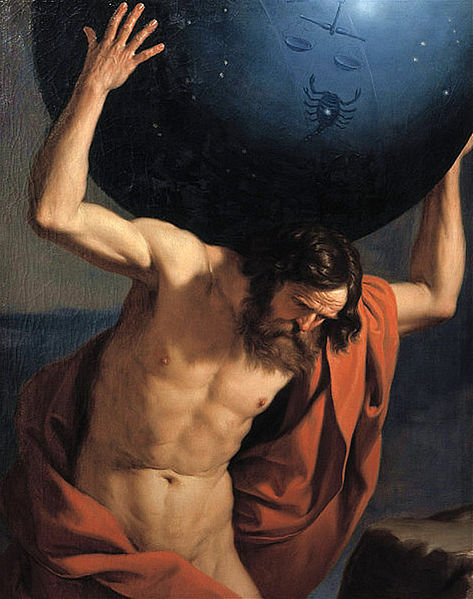 To this end, the parents of Atlas were the Titan Iapetus and his wife Clymene, an Oceanid. Iapetus had taken an active role in the rise of the Titans, holding down Ouranos whilst his brother Cronos castrated their father. Thus it was that in the Golden Age of the Titans, Iapetus and Clymene became parents to four sons, Prometheus, Epimetheus, Menoeitus and Atlas. Atlas was also named father of the beautiful Pleiades by the Oceanid Pleione, and the Titan was also named father occasionally of the Hyades, Hyas, the Hesperides and Calypso. 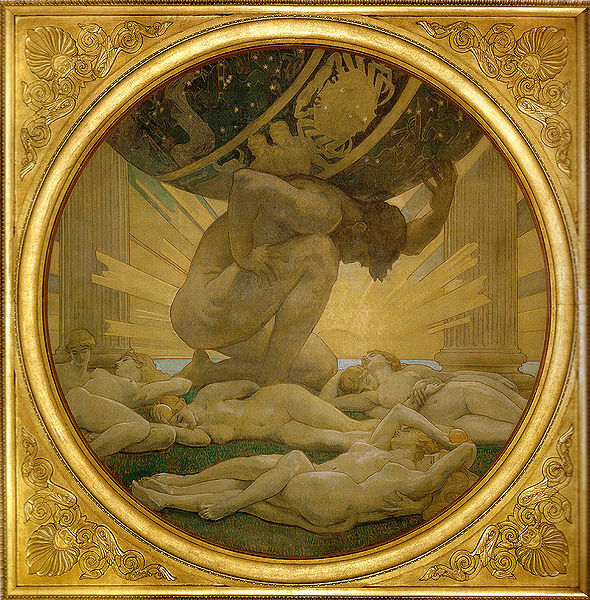 ​Atlas would be the Greek god of astronomy and navigation during this time, but in truth he was most widely thought of being the strongest of all Titans, eclipsing the strength of his father and all other Titans. It was this characteristic that would bring him to prominence. The rule of the Titans would come to an end when Zeus led an uprising against his father, Cronos. Two armies assembled, with Zeus and his allies upon Mount Olympus, and Cronos and the Titans on Mount Othrys. Epimetheus, declined to fight; Prometheus having foreseen the result of the war. The result of the war was inevitable, for despite the immense strength of Atlas, eventually the Titans were outgunned when Zeus recruited the Cyclopes and Hecatonchires to his side. After the war, Zeus punished those who fought against him, and this meant that the majority of male Titans were incarcerated in Tartarus, but Zeus dished out a special punishment for Atlas. During the Titanomachy, Ouranos, the heavens, had been shaken and could no longer hold himself aloft. So Atlas was punished to hole the celestial globe in place for all eternity. This the Titan did from a position within the Atlas Mountains of North Africa. Despite the many depictions of Atlas, it was the celestial globe that Atlas would hold aloft, not the Earth. Atlas would reappear in Greek mythological tales during the time of Zeus and the other Olympians, although the various tales do not necessarily tally. Famously, Atlas would be encountered by the most famous of all Greek heroes, Heracles. Heracles had been tasked by King Eurystheus to bring back the Golden Apples of Hera, which had been a wedding present for the wife of Hera from Gaia. The Golden Apples were located within the Garden of Hera, as were many other special items of the gods. This garden was guarded by the dragon Ladon, and tended to by the Hesperides. Heracles though did not know where the Garden of Hera was and so had to seek out the help of Atlas. In one version of the myth, Heracles offers to hold the heavens whilst Atlas retrieves the apples, something that would be a simple job for Atlas, with his knowledge, strength and the fact that the Hesperides were his daughters (maybe). Thus Atlas easily kills Ladon, and returns to the Atlas Mountains with the Golden Apples. The Titan then declines to swap positions once again with Heracles, and instead offers to do another favour for Heracles by taking the Golden Apples back to King Eurystheus. Heracles realises that he is in a position that could see him trapped for eternity holding up the heavens. So Heracles agrees to Atlas’ suggestions, but asks Atlas to hold up the heavens briefly whilst he adjusts his cloak to make himself more comfortable. Atlas stupidly agrees, and so Atlas soon finds himself in the position that had occupied him for so long, and Heracles had no plans on being in that position ever again. In alternative versions of the mythological tale, Atlas simply tells Heracles where the Garden of Hera is, and how to get pass Ladon and the Hesperides. In another version of the same story, Heracles did release Atlas from his punishment, by building the Pillars of Heracles to hold the heavens aloft. A second famous tale about Atlas sees the Titan encountering another Greek hero, Perseus. Perseus was on the return leg to Seriphos with the head of Medusa safely in his possession. 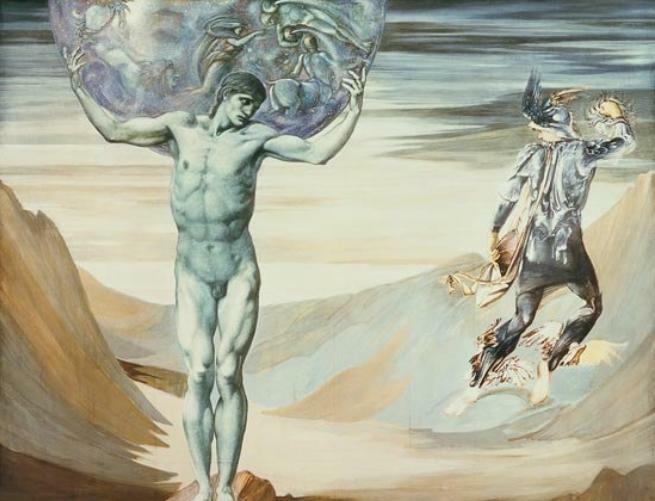 Perseus decided to rest by Atlas, but the Titan was in a far from hospitable mood. An angry Perseus therefore removed the head of Medusa from its satchel and the gaze of the Gorgon turned Atlas to stone. The stories of Atlas and Heracles and Atlas and Perseus cannot be reconciled though, for Perseus was the grandfather of Heracles, and the Titan was not petrified in the time of Heracles. The Titan Atlas was not the only Atlas from Ancient Greece though, and this has led to a great deal of confusion about which Atlas is being referred to. In Greek mythology, there was an Atlas who was the son of the sea god Poseidon, and this Atlas would become the first king of Atlantis. There was also another King Atlas, with this ruler being the King of Mauretania, an ancient kingdom roughly equivalent to the coastal area of modern day Morocco. This King Atlas was a master of astronomy, mathematics and philosophy, and it is sometimes claimed that it was this Atlas visited by Perseus. The skilled King of Mauretania though was an inspirational figure, and the Flemish cartographer Gerardus Mercator would make allusion to his Atlas during the 16th century. When Mercator published his work, he depicted a man holding up a terrestrial globe, causing an everlasting confusion about the role of the Titan Atlas.